Taxis are available 24 hours a day at Dakar International Airport. They are recognizable by their yellow color. They do not have a taximeter and any ride outside Dakar must be negotiated with the driver before entering the vehicle. 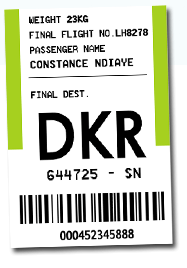 For a ride to Dakar and its suburbs (Ouakam, Ngor, Yoff, Mermoz) official rates are displayed in the hall of the airport and is fixed (around 7.5€ the ride according to the hour). The Dakar Dem Dikk bus line 8 takes travelers from the airport to downtown Dakar with various stops including Yoff, Patte d'Oie, Grand Yoff or Cheikh Anta Diop University. Depending on the trip, the cost varies from 150 to 175FCFA (0.23 to 0.27€). Buses leave approximately every 10 minutes from 6:00AM to 8:30PM. Minibus operated by hotels run between the airport, the city center and the tourist areas. If you plan to stay in one of them, ask if a shuttle is offered to guests. Private services of fast and comfortable shuttles are also offered to travelers to reach different localities. Several car rental companies offer their services in Senegal. Some of them have an office in Dakar International airport where to pick-up your car 24h a day and others provide you with the car on your arrival. Several companies offer VIP transport service at the airport at an unbeatable price. From the airport to your hotel or residence, anywhere in the country, comfortable and air-conditioned limousines or minibus drive you safely through your journey. These services are available on request.